Influencer marketing isn’t new, but it is rapidly gaining popularity among brand marketers. They are turning to influencers to help combat ad avoidance, bring fresh creativity to their marketing (in particular, video marketing) and gain cachet with young people, who place more trust in celebrities and social media “stars” than others do. There are a growing number of talent agencies and influencer networks that aim to automate the process of finding influencers, working with them and measuring results. This may make it easier for brands to scale their efforts. Influencer spending is increasing. Some marketers are starting to use their advertising budget rather than PR or marketing dollars to fund campaigns. Measurement is getting better but still has a long way to go. Successful brands focus on engagement metrics (rather than total audience) and then layer on qualitative metrics. Some are taking steps toward measuring the impact on sales, but this can be tricky. Brands may think influencer marketing is just about working with social media stars and celebrities, but they should look beyond the top names and cultivate emerging talent that has an engaged audience related to their industry. Giving influencers creative freedom and striving for a symbiotic relationship are two other best practices for success. 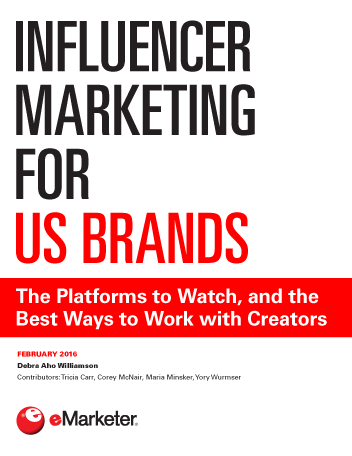 "Content promotion and creation are two key reasons marketers are turning to influencers."